Life is more than just not taking “no” for an answer. Life’s full of “no answers,” aren’t they. That you can’t control. That you’ll have to live with. What you don’t have to live with is a “no attitude.” Your outlook can be different, even in the face of challenges. My wife, Jen is introducing a new seven-day journey through God’s Word. I think you’ll really enjoy it. 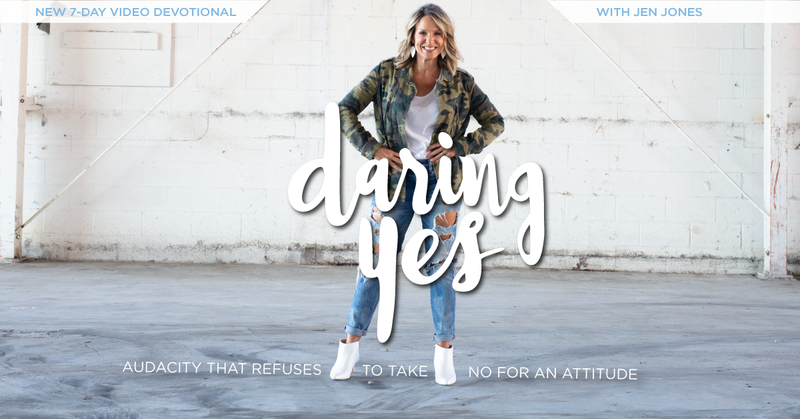 Let your future be ignited by a simple, yet deeply transformational… DARING YES. And an audacity that refused to take NO for an attitude. Ever felt like you’re not good enough? Well, you’ve got to get a load of what GOD has to say about it. This new 14-Day experience just for women is right around the corner. And I’m so excited for you to be a part of it. Register for “She,” right HERE and discover who you really are in Jesus. My wife makes this stuff look easy. I took a solo run at the parenting helm this past week. My wife was out of town at a conference, which meant I was left to manage the domestic ship all by my lonesome. And I’ve got to say, three days in: My wife makes this stuff look easy. I sent her off with a hug, a kiss and a reassuring look, desperately trying to convince her that all would be well. It dawned on me about 30 minutes in that I had failed to gather all the fine points of detail on the nuanced balancing act that is my kids’ daily calendars. Before she even hit the airport, I was texting my request for full play-by-play to be remitted to me via email. She of course knew every practice and play date off the top of her head and had the deets to my inbox before she hit the security x-ray. She makes this stuff look easy. I did my best, mind you. I think I’m a pretty good dad. I’m invested. I love my kids. I show up for all the big moments. I sit down with homework most nights. I cook on occasion. But managing all my responsibilities—and her’s when she’s away—is a task I tend to butcher, if I’m being honest. I’m a decent version of Dad; I’m a horrible substitute for Mom. Because she makes this stuff look easy. Things ran long for me at work yesterday. 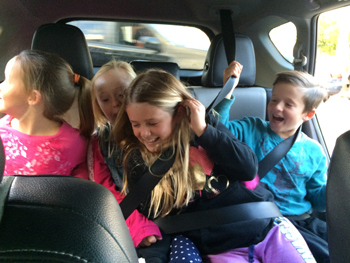 That means I arrived at school pick-up in the wrong car, and had to cram four kids in a space meant for three. Torqueing and teetering under the pressure, I toggled a laser focus between my profession and my progeny—only to discover I was less than sharp at either. Jen does the same multi-tasking thing too. Only she makes this stuff look easy. I’m just not as good as her in so many things. Just ask my kids. They’ll confirm my below average marks. I don’t pack lunches very well. I’m terrible at making the bed. I try my best to be patient, but the cacophony in the car sometimes causes me to blow my stack. I want the house to remain clean. I just seem incapable of making it so in quite so lovely a way as Jen. Candidly, I barely make it out of the house having showered, and I don’t even have to comb my hair. She does all that and more, and looks gorgeous doing it. I’m telling you… she makes this stuff look easy. 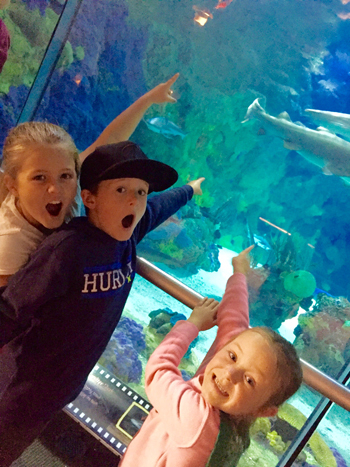 Today, I took the day off work and invited my kids to SeaWorld. I figured I’d focus all my attention on the four most important little feet walking the planet. And I did. That is until I had some kind of strange allergic reaction somewhere between the sharks and the shell fish exhibit. My eye became so swollen it nearly closed for business entirely. And as I stood there in line for the roller coaster, digging through the backpack for time sensitive snacks and attempting to deftly settle the arguments of who would board which amusement ride first… As I tried to snap pictures for posterity, encourage little anxieties and squint through a swole-shut eye lid, I thought to myself something I should have emblazoned on my next t-shirt: My wife makes this stuff look easy. Here’s to you, moms. Thanks for all you do to make the world go ‘round—and for making it look as easy as you do. Family life can get a little crazy. Any parent can tell you that. In fact, if you’re a mom or a dad and you haven’t considered checking yourself into the Nut House on an occasion or two, you simply haven’t been in long enough. Maybe you’re like me: you’re doing the best you can, but the crazy stress of raising littles just keeps showing up at the speed of life. My kids are like yours. They’re growing up really fast. The clock is spinning quickly and I’m constantly grasping for strategies to stabilize my parenting. But the goal of parenting isn’t to help my kids grow up. They’ll do that whether I want them to or not. The goal is to help them mature before they grow up. Ever met an adult who grew up but never matured? Maybe you married him. But our lives as parents are at their most influential when we help our children grow mature, solid lives. Life’s moving fast. There’s no changing that. But if we can appreciate the brevity of our lives, and approach God for help, we can parent at the speed of life with wisdom. SHOW THEM HOW TO PRIORITIZE OTHER PEOPLE. Left to their own devices, children will grow up thinking the world revolves around them, rather than selflessly and joyfully revolving around others. Great parents awaken this essential perspective in their kids. TEACH THEM THE PRINCIPLES OF HARD WORK AND RESPONSIBILITY. This one’s in short supply nowadays. Sometimes, parents—out of a misplaced sense of love and care—over-nurture their children to the point that they are ill-prepared to make their own way in the world. Save your kids the wounds of immaturity and teach them the principles of hard work and responsibility. LEAD THEM TO RELATIONSHIPS THEY CAN LOOK UP TO. Your child will need more positive input in their life than just you. And smart parents lead their children to strategic, significant influences they can look up to. Great parents don’t assume their kids will pick it up by osmosis somewhere along the line. They don’t just cross their fingers and hope their kids choose good friends. 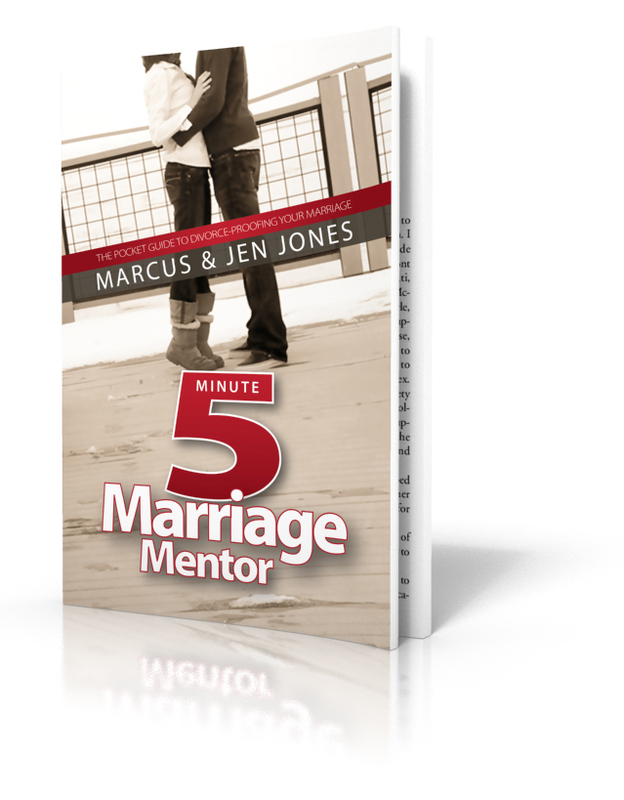 Great parents inject themselves into those choices and lead their kids to life-giving relationships. Who are you partnering with? Who’s coaching your kids in sports? What college young person is hanging out with your young person? What youth or children’s program is supporting you in parenting at the speed of life? Because as influential as you are as a parent, you need strategic partners to help grow your child into a mature person before they grow up. CHALLENGE THEM TO DECISIONS DRIVEN BY HIGH-CALIBER CHARACTER, NOT HIGH-OCTANE EMOTION. We live in a society dominated by high-octane emotion. Entire industries are built around it. That’s why car dealerships even exist. Only truly rare people make decisions driven by high-caliber character. What’s the right thing to do? What’s the wise thing to do? What’s honorable in this situation? It’s the step that asks, “What do I truly value—regardless of the sacrifice?” and makes decisions from there. That kind of value system actually protects our kids from harm. MODEL THE VALUE OF GRACE AND GRATITUDE. If you’re child never values grace, they’re doomed to be a judgmental, critical person. If they never embrace the value of gratitude, they will become an entitled brat. And you and I both know plenty of adults who grew into judgmental, critical brats without every maturing into something better. Your kids don’t need everything they want in order to live a great life. In fact, if you could give them everything, you’d ruin them in the process. They need to understand that the world doesn’t revolve around them. But that if they will mature in the value of grace and gratitude, they can revolve around it with a profound joy that the world will marvel at and be drawn toward. What do you think? Drop some knowledge on us with a comment. I was having an incredible year. In 2004, I was going to be a new father. My wife, Jen and I felt like the world was unfolding gloriously before us. The spring promised yet another blessing and we teemed with a fresh excitement about our burgeoning family. But March arrived with more than anyone could have ever dreamed. When our daughter, Addison Grace, was born, the thrill of new life was side-swiped by severe medical complications that threatened death. There came Neonatal Intensive Care Units and scary reports from doctors that sent nurses and orderlies scurrying. And then came the unexpected, thunderous diagnosis: Down Syndrome. And I was having such an incredible year. All of the sudden I went from the thrill and exultation of a dream, to the challenge and sorrow of a profound disappointment. But as it turns out, I was still having an incredible year. I just didn’t know it yet. What I came to discover—even in the midst of my darkest night—is that pain, as gut wrenching as it can be, truly shapes us. Struggle—as unexpected and unwelcome as it always is—has the potential to actually catapult us into an amazing future. I didn’t know it then, but I was getting ready to walk out a wondrous truth: that sorrow doesn’t stand a chance in the joy-filled face of Grace. And so I’ve told my story—in a new book. It’s all about this dad’s walk holding hands with two incredible people. They’re two people that showed up in unexpected and astonishing ways—whose presence in my life have left me forever changed for the better. They’re two marvelous, Marcus-changing people who share a common middle name: my first-born daughter, Addison and my Savior, Jesus. Grace was His middle name too. I didn’t know it then, but the first time that first doctor handed me my first-born, I was grabbing on to the adventure of a lifetime. Addie is eleven now. And I’ve only recently come to realize how much my story is actually our story—together. You and me. “All-of-the-sudden Sorrows” come hunting all of us from time to time. 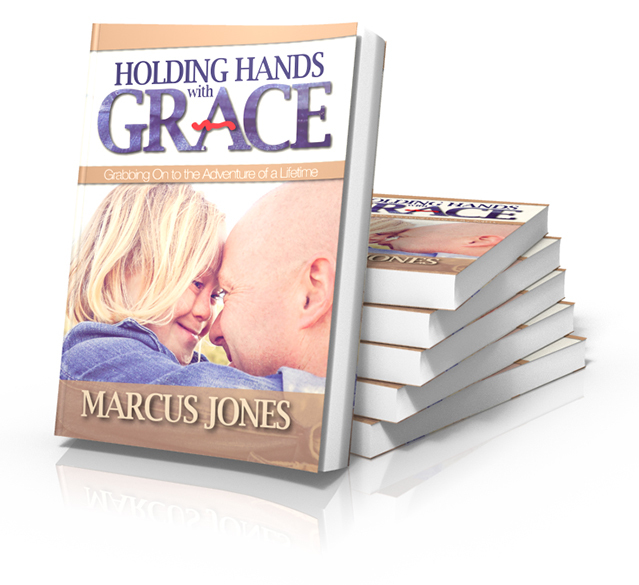 But GRACE means holding hands with something traumatic and gloriously transformative at the same time. There can be profound meaning in the pain. In fact, we can discover what it means to grab on to the adventure of a lifetime—even if we never saw it coming. I hope you’ll read the book. I hope it encourages you no matter what kind of year you’re having. Because the same Jesus who met me in the dark alley of my disappointment stands ready to meet you in yours. And He desires more than anything to see your pain transformed into miraculous purpose right in front of your eyes. Sorrow doesn’t stand a chance in the face of that kind of Savior. 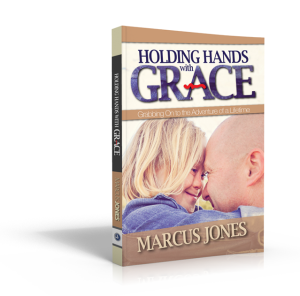 All you and I have to do is begin Holding Hands With Grace. Let me know what YOU think? Post a comment. We had a family movie night this past week at my house, and Dad decided to kick it Old School. I have four kids: 11, 9, 7 and the little one is 5. And this diminutive crew was about to have their first-ever encounter with one of the best suspense movies ever: Jurassic Park. I say “Old School” because it’s been over 25 years since Jurassic Park came out. Long enough for kids born after the release to be long graduated with Master’s Degrees. But it has maintained its verve on the suspense movie scoreboard in my mind. Yeah, I know… a little scary for the littlest of the lot. 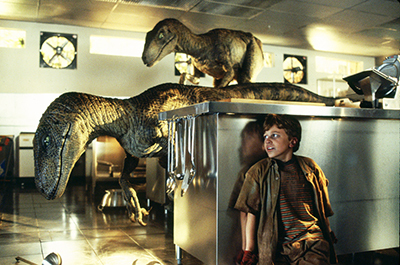 But I figure a kid’s got to come to grips with man-eating dinosaur fear sooner or later. Why not sooner? And yes, my kids will likely spend some time in therapy later. I found it hilarious—if not somewhat twisted—to watch their different responses to fear. You know when Dinosaurs starting stomping around eating everyone in sight? Some of them leaned forward. Some of them pulled the covers over their heads. The little one scurried out of the room at one point, retrieving a coloring book and crayons from behind her Barbie® Playhouse. She then snuck back into the room, positioned herself immediately behind my back, and began coloring. Her choice of rampart effectively blocked her from the screen, and the aforementioned man-eating dinosaurs. Whenever I moved, SHE moved. When I zigged, she zagged. It was a dance in silhouette that I brought a big grin to both our faces. We all get afraid. And everybody draws up a strategy for fear-avoidance at some point. But beyond being cute in a dinosaur DVD, real fear can cripple us. The power of fear can imprison us. Fear holds us back and undermines our opportunities to make a difference in the world. Peter knew it. Matthew 14 describes a scene straight out of a Spielberg suspense flick: raging sea, stormy gale, night black as pitch. But in spite of everything that loomed to put a shiver down Peter’s spine, ol’ Pete made a decision. He decided on this night that his fear wouldn’t get the best of him. There would be no shrinking back. And before his friends could strap a life jacket on his broad shoulders, or graciously lash him to the mast, Peter was out of the boat, walking on the water. He walked, not out of duty or obligation. He walked, not pressured or cajoled into it. He walked on the water out of a deep desire to be closely connected to his friend. And his friend just so happened to be Jesus—the world’s greatest Storm Stymier. Scary situations come hunting all of us. Fear isn’t picky. And my guess is he’s visited your place many times. He’s invaded your calm water when you least expected it. And what stands between you and an incredible, miraculous encounter with Jesus is the Water of Fear—the Sea of Suspense. You have more in common with Peter than you think. You have a choice: you can let fear whip you, or you can walk on it. You can try to hide under the covers if you want. You can bust out the crayons and coloring books. You can even try to find someone or something to distract you from facing the fear. But sooner or later, you’re going to get steam-rolled by the storms of this life. Are you going to let it WHIP YOU or will you WALK ON IT? Jesus is inviting you toward an incredible, miraculous connection with Him—the Sovereign walking on the Sea of Suspense. And the only thing holding you back is a pesky, little, measly thing called “your boat.” If you listen carefully, you may just hear what Peter heard. That maybe it’s time to crawl right on out of comfortable, and start walking on the water of your fear. And even though the storms will rage, and faltering faith will try to sink your soul, the Hand that holds you fast—imperishable, unsinkable—will be the hand of the Man named Grace. I’ve always thought daredevils were crazy. Not really my deal. Close friends of mine are adrenaline junkies, but I usually opt for the path of repose. They jump off cliffs at the beach; I sip soda from the sand. But I’ll never forget the first time I tried to gambade off a bluff with some of my buddies. The perch didn’t look that high from the safety of the boat, but as I clambered up the slippery rock face, and stood at the precipice of the highest drop I’d ever jumped, my abdomen and my Adam’s apple shook hands. A high dive will do that to you. Free falls from height should strike a little fear in your heart, right? It only stands to reason. “People have killed themselves doing this, haven’t they? My mother wouldn’t approve!” But there are times in our lives when the only way to step into the next big adventure is to take a leap into thin air. One year ago today, I took another leap—another cliff jump—another free fall into our next great adventure as a family. A year ago last week, I stood on the platform of a church I had served for nearly a decade—a church I had built a great life and ministry in—a church that had been the nursery of our little Tribe. I stood on a gigantic platform of safety and announced that my wife and I would be holding hands and vaulting into a tiny, altogether different sort of pool. We would follow the call of God and plant a church in water we’d never jumped into before. And there was room for only two on the platform at a time. As we leaped, my abdomen and my Adam’s apple shook hands again. The first step was indeed a doozie. But as we left the ledge of security, we experienced the freedom that comes in the free-fall of faith. 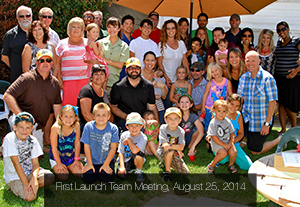 We gathered with an intrepid band of other adrenaline junkies in the backyard of a family friend, and began the adventure of building a brand new church from scratch. The rock face was a little slippery at times. The adrenaline rush would swing between fun and fear on occasion. But we had front row seats to see God do something that could never have been witnessed from the conservative seat of serenity I would have normally chosen. Here in the free-fall, we saw God provide miraculously for His children. We watched a Jesus-calling begin to be answered by scores and scores of people saying, “Yes,” to Him. I watched my own life being stretched and strengthened as I learned first-hand what it is to depend completely on Christ, and unequivocally know His love for me. A year ago today, I stood holding hands with my wife atop the scariest cliff we’d ever seen. There was only room for the two of us—no safety in numbers. Just the gut wrenching, “go-big-or-go-home” dive into the dream of God. But to our delight and amazement, God wasn’t hollering to us from Heaven. He wasn’t cheerleading from the cliff-face. He was welcoming us from the water. He was already in. He had already taken the jump before we had. Jen and I were merely joining Him in action. It’s been a year. A year falling off the most fantastic mountain I’ve ever seen—a year of my guts sometimes shaking hands with my gizzards. But one year, nonetheless, of diving into the most pristine waters of God’s magnanimous plan for our lives. And I’ve learned a few things. I’ve learned that in spite of that dubious first-step, the genesis moment of life-leaping faith opens the door to an incredible adventure—one that you could never conjure on your own. And that if you hear the whisper of invitation from the King Himself, you can be sure that it comes not from some wispy cloud in the sky, but from a Heart love-packed for people in the harvest field below your feet. He’s already in the water. Let abdomens everywhere begin shaking hands with Adam’s apples. May the free-fall of faith thrill you and wreck you and make you into the mission of Jesus. For there is no higher height to which you can ascend than leaping and lowering yourself into the waiting arms of God Himself. Annie died today. And it should never have been. A little girl, two years old–a precious, little heart of incalculable worth–was lost just a little while ago. And it should never have been. 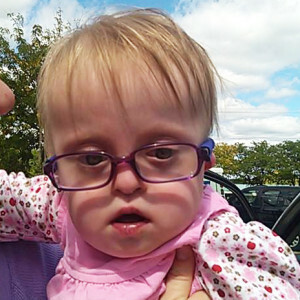 Annie was born with Down Syndrome, and some would say with “special needs.” She was a bright and unique light in this world—an epiphany custom-made in Heaven itself—which imbued her with unique and exceptional abilities. Anyone with half a heart could see that. In spite of all her brilliance, Annie had a extraordinary challenge: the need of a new heart. Hers was failing. A transplant would have saved her life. But a transplant would never come. Annie died today, a result of being denied a new heart by her doctors due to her genetic diagnosis. The quality of her life was forecast—not by her parents, friends and loved ones, but by a medical litmus that deemed her spark to be inferior to that of people with typical genes. The hospital rejected her appeals for necessary treatment and on the basis of an abhorrent reality: that people born with a particular distinction may not, in fact, always be treated as whole people. And it’s an insidious bigotry that has been bubbling under the surface of our America’s libertarian façade since day one. It is a prejudice that demeans and whacks wonderful people down to a fraction of their whole. But in fact, who’s really the one in need of the heart transplant? Pervasive, long-antiquated prejudices are the knife-blade at the throat of America’s humanity. Just look at Annie. You SHOULD be agog. You SHOULD be aghast. An exquisite, irreplaceable, extraordinary person just slipped from our grasp. And we are all diminished. She died today, not because her heart failed, but because ours did. Our heart: chambers calcified with bigotry and hubris. Our heart: arteries clogged with a self-consumed penchant to play God. Don’t point at her little heart. The blame is squarely on ours. She died today because in our minds she wasn’t “person” enough to deserve a new pump. 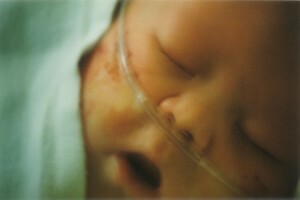 She wasn’t whole enough to deserve a new heart—not a child enough to warrant a fighting chance. There was more than one person who needed a heart transplant today. The lack in the one snuffed out the life of a toddling treasure. The lack in the other will surely choke the nation in time. A precious little heart of incalculable worth was lost just a little while ago. It should never have been. And anyone with half a heart could see that. What do you think? Weigh in with a comment below. My oldest daughter, Addie, is an incredible person. At ten years old, she is sweet and kind and generous to others. She loves Disney® Channel, Reece’s Pieces® and is gaming a force to be reckoned with on Sonic Dash. For just over a decade now, she has enriched her dad with a life full of “ups,” in spite of being born with Down Syndrome. But somebody just bullied my baby. Not sure who thought they had the right spitting in the apple of my eye. But somebody just bullied my baby. Some brigand in a back room somewhere, lambasted my little lamb with sinister, scathing words: “You’re stupid and dumb,” they began, and moved on from there. “Retarded.” “Ugly.” You fill in the blanks. Hate-filled speech that’s vomited out on playgrounds the world over, no doubt. But this time, the bully came hunting my baby. Addie had to spend one of her lunchtime recesses in the principal’s office this week—a direct result of slapping some sense into this one ignorant bully. Her aggressor did some time too, but this dad couldn’t just leave it there. Yesterday, I picked up the kids from school with a swagger in my step. This was an episode that warranted a celebratory ice-cream cone in my book. Principals have their principles. I have mine. As we drove to McDonalds® for a frosted award, I affirmed my 40-pound little girl for sticking up for herself in the face of a bully more than twice her size. I told her she was beautiful and lovely, that she was special and smart, that she was the most precious of gifts to her dear old dad and that hateful words would never change that. We value our name because it communicates our belonging in just one word: Jones. I reminded my kids as we walked under “the arches” that, “we never forget who we belong to,” that we are, “always loving, protecting and enduring any hardship…together.” No matter how big the bully gets, we face injustice head-on…together. This is at the core of who I am. When a bully rears his ugly head near my house, Joneses circle the wagons. We always love. We always protect. We endure any hardship…together. Now, I know violence isn’t the answer to every snub. I’m not condoning brawling as an approach to relationship building. In spite of my impetuous post, I don’t believe we should retaliate against unkindness with more of the same. And I believe there are plenty of reasons—scary, abusive reasons—why bullies exist in the first place. But before you start tossing out the “What Would Jesus Do’s,” make sure your point of reference isn’t a WWJD caricature of the real guy. Most people flip a phrase like that with a particular (I would argue, skewed) picture of Jesus in mind. He’s the meek and mild guy. You know: white dude with a beard, blue sash and sandals. He’s diminutive and retiring. He’s a washrag of a man. Now I’m not discounting the meek and mild Jesus. He is kind, gentle—the epitome of grace. Thank God He is. But that kind of love has more than one face. And you should see the other guy in action too. There’s coming a day when an altogether loftier sort of Father is going to finally draw a line in the sand. The Lord Almighty, seated on His throne, will arise from His rest and slap ignorant evil full in the face, one final time. That’s what Dad’s do when their baby gets bullied. So the next time you get carried away with the caricature of a mealy-mouthed Jesus, petting ponies in the pasture, read the last chapter of the Word that He left us. Because #youshouldseetheotherguy. And never again, when you’ve held hands with Dad, will you ever have to stand alone against the bully. You belong to Him. The Savior always loves, always protects, always endures any hardship your enemy musters against you. And THAT is the value of His Tribe. I love going to the County Fair. It is the undeniable cultural experience of the summer, isn’t it? The Fair is where you stuff your face with all manner of culinary confections that you’d never eat anywhere else. It was the Fair that gave us deep-fried Twinkies® and the world’s largest donut. And every time I go, I feel compelled to take it all in. But the sadistic thing about the Fair is that the food isn’t the only bad decision you’re going to make that day. You go straight from grease-eating to roller-coastering. The rides at the Fair are kind of like Disneyland, only without all those pesky safety features. You pack your stomach with fried carbs and lard, spin it around on a Carnie Special and then top it all off with a gigantic turkey leg and funnel cake. Is it any wonder I’m half doubled over before I get back to the car? I usually feel less than fair by the time I’m leaving the Fair. Are you willing to admit you can be a little bit selfish at times? When I want my way, with little or no regard for the cost to others, I’m about to take a nosedive over the stumbling block of self-centeredness. Mark Twain once said that, “Bitterness is like drinking poison and hoping your enemy will die.” Maybe you were hurt or wronged, and have a right to be angry. Maybe your woundedness isn’t your fault. But bitterness will cripple you if you carry it around. It will choke the life right out of you. This is pride that won’t admit when it’s wrong—that holds onto a grudge. I know people who would rather get a divorce, lose a job or a friendship than humble themselves. Proverbs 16 says that, “Pride comes before a fall.” Arrogance literally tumbles you. Shame is different than guilt. Guilt says, “I did something wrong.” Shame says, “I’m wrong AND defective—unredeemable.” Shame is destructive. It shuts us down. It’s crippling effect holds healing at bay. Shame is like camouflage to the real cancer in our lives, and it injects a powerful toxin into our relationships. This is the worst of the toxins. Fear rushes over us like a black wave. Fear blows into our lives as a bitter wind. We do strange things when we are gripped by fear. And it is fear that is the enemy of faith. Why do wives withhold affection from their husband? They’re afraid of being hurt. Why do employees do less than their best? They’re afraid of being taken advantage of. Why do dads disengage from their families? They’re afraid to look stupid or that life will be less fulfilling by investing at home. Why do we avoid God and run from His love? We fear that God’s plan will not be as life-giving as the one we might come up with on our own. But like each of the previous toxins, this fear trips us up from really catching our stride in life. It tumbles our relationships. …God is there, ready to help; I’m fearless no matter what. Who or what can get to me?